During this activity children will not only be able to use their creativity, they will also learn to eat "five-a-day" of fresh fruits and vegetables as well as the idea of eating all the colors of the rainbow. Children will gain an appreciation for root vegetables while creating their collages and puppets, and learn that we eat all parts of a plant. Children will explore vegetables and fruits first through feeling and then seeing. From seasonal fiddlehead ferns to the flower buds on a broccoli, they will see things they never saw before. 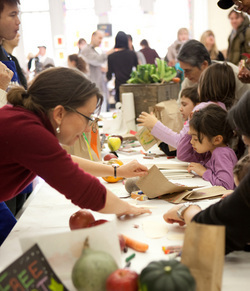 In addition to STUDIO's art activities, Teachers College, Columbia University will demonstrate nutrition experiments, and GrowNYC will provide cooking demonstrations. More than 200 children across the city were represented in this charming show at the 1285 Avenue of the Americas Art Gallery. Read more and view a slidehow of images from the exhibition opening here. 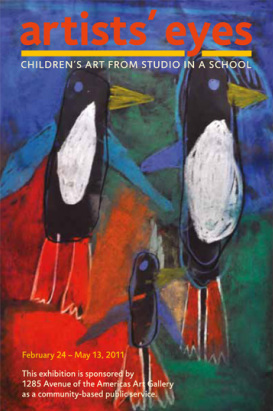 This exhibition of children's art is sponsored by 1285 Avenue of the Americas Art Gallery as a community-based public service. The exhibition is on view from Feb 24 through May 13, 2011. More than 200 of New York City's youngest artists—kindergarten through 6th grade—are featured. This show includes art created by students engaged in the Art & Healthy Living Program. We celebrate the opening of these young artists’ eyes and the beginning of their artistic journeys. 1285 Avenue of the Americas Art Gallery is located between 51st and 52nd streets. Come here to find the latest updates on what's happening with the Art & Healthy Living Program!